Who doesn’t love a rogue angel tempting fate? 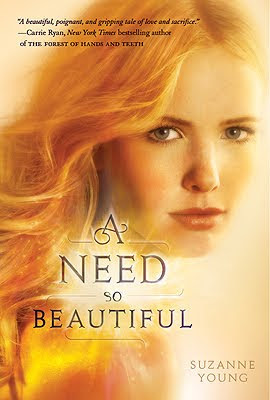 Because that’s exactly what you get in GCC Member Suzanne Young’s new novel, A NEED SO BEAUTIFUL out this month through Balzer&Bray/HarperCollins. Charlotte’s best friend thinks Charlotte might be psychic. Her boyfriend thinks she’s cheating on him. But Charlotte knows what’s really wrong: She is one of the Forgotten, a kind of angel on earth who feels the Need—a powerful, uncontrollable draw to help someone, usually a stranger. But Charlotte never wanted this responsibility. What she wants is to help her best friend, whose life is spiraling out of control. She wants to lie in her boyfriend’s arms forever. But as the Need grows stronger, it begins to take a dangerous toll on Charlotte. And who she was, is, and will become—her mark on this earth, her very existence—is in jeopardy of disappearing completely. Suzanne: Oh, gosh. Most of my college years were spent on road trips. How can I pick one?? Hm, maybe the time we took a trip up to Geneseo College and attended a party, only to have my car nearly explode on the way back to the dorms. It was actually kind of hilarious. Suzanne: It really depends on the story. Lately my stories have become more complicated, so I’ve had to jot down a sequence of events—not a real outline. Especially since I write them on the backs of restaurant napkins. Suzanne: I was parking in my garage when my agent called me. When he first told me, my response was, “Seriously?” As if my agent has time to prank call me at 8am. I sat and cried in my car for a little while after, but it was all celebration that rest of the week. Thank you, Suzanne! Now, everyone go out and buy books, lots and lots of books!